As we sell mainly online, our premises are not set up as a shop but customers may collect their purchases, at a time agreed in advance. We discourage drop ins as we're often beavering away to get orders out to online customers or out and about making deliveries. All Yellow line buses pass by the end of our street. You can find more details of the timetables here. The closest bus stop is a short walk away. If you are coming from town, alight at the bus just after the Goose Fair roundabout. If you are coming into town, get off the bus just after the Shell garage at the bottom of Sherwood Rise. 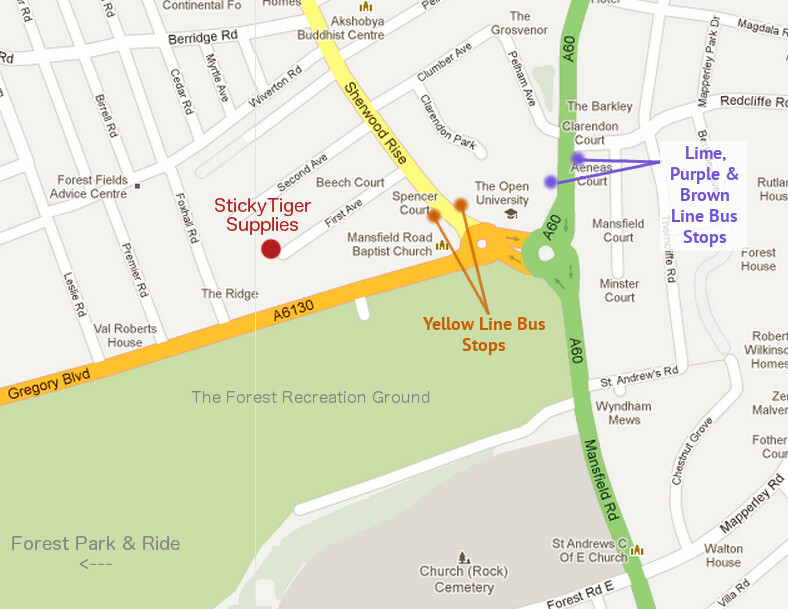 Alternatively, green, purple and brown lines all come close where you can alight just before the Goose Fair roundabout at the Forest Recreational Ground, or just afterwards at Clarenden College. It is a 5 minute walk from there. Nottingham City Transport has an excellent journey planner here. There is limited on street parking during the day, although usually plenty in the evening. If you are using a Sat Nav, use NG7 6JL for finding us. No. 7 is at the end of the cul-de-sac. You'll see a white garage as you drive down the street. This is our driveway and The Craft Room can be located up the stairs from the driveway and on the left hand side. Well done, by far the cheapest and healthiest way to do it! Make your way to Sherwood Rise, First Avenue is a street that is directly opposite the Shell garage at the bottom of Sherwood Rise. No. 7 is at the end of the cul-de-sac. You'll see a white garage as you walk down the street. This is our driveway and The Craft Room can be located up the stairs from the driveway and on the left hand side.